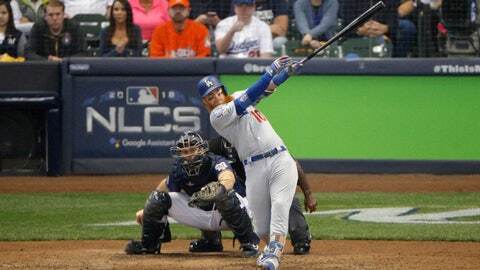 MILWAUKEE (AP) — Justin Turner and the Los Angeles Dodgers know all about performing in the postseason. Backed into a tough spot Saturday, the red-headed slugger delivered once again. Shut down for most of the afternoon, Los Angeles staged another late rally and Turner hit a two-run homer in the eighth inning to lift the Dodgers over the Milwaukee Brewers for a 4-3 victory that evened the NL Championship Series at a game apiece. The high-powered Dodgers had two measly singles off Wade Miley before breaking through against one of baseball’s best bullpens. After forcing the Brewers to use six relievers in Milwaukee’s 6-5 victory Friday night, the NL West champions put that extended look to good use in Game 2, especially against faltering All-Star Jeremy Jeffress. “As long as we have outs left, we know we’re in the game,” Turner said. Milwaukee wasted a terrific performance by Miley in its first loss in three weeks, ending a 12-game winning streak that produced free burgers for its fans as part of a promotion by a local restaurant chain. Orlando Arcia and Travis Shaw homered, and Lorenzo Cain robbed David Freese of a two-run drive with a leaping grab over the wall in center . Miley pitched 5 2/3 scoreless innings in his second career playoff start and had two hits in his first multihit game since 2014. The best-of-seven series moves to Dodger Stadium for Game 3 on Monday night. Walker Buehler pitches for Los Angeles and Jhoulys Chacin gets the ball for Milwaukee. Miley handed a 2-0 lead over to his bullpen and Shaw tacked on a solo drive in the sixth , delighting a yellow towel-waving crowd of 43,905 at Miller Park. But that was the last run for the Brewers, and the Dodgers finished off their rally this time around after nearly taking Game 1. Cody Bellinger got Los Angeles on the board with an RBI single in the seventh, chasing Corbin Burnes and stopping an 0-for-15 slide in the playoffs that landed him on the bench at the start of the game. Austin Barnes forced in another run with a bases-loaded walk off Jeffress, but the right-hander escaped when pinch-hitter Yasmani Grandal bounced into a double play. The Dodgers went right back to work in the eighth. Chris Taylor reached on a leadoff single before Turner hit a long drive to left off Jeffress, admiring the ball with his bat pointed toward the sky before rounding the bases and participating in several different celebrations with his giddy teammates on his way to the dugout. Turner bounced back after striking out a career-worst four times in Game 1. Jeffress also struggled in Game 1, allowing two hits while only recording one out. He was charged with two runs and six hits in 3 1/3 innings in three appearances in the Division Series against Colorado, including a blown save in the opener. Los Angeles has scored eight runs against Milwaukee’s bullpen, all in the seventh inning or later. “The more you face the relievers, the easier it’s going to get,” Bellinger said. It was Turner’s seventh career playoff homer. He was co-MVP of the NLCS last year with Taylor when Los Angeles made it to the World Series for the first time since 1988. The Dodgers are making their sixth straight appearance in the playoffs while the upstart Brewers are in the postseason for the first time since 2011. That advantage in experience seemed to pay off — especially when Turner came up with the big blow. “He personifies everything that I believe in as a baseball player, as a professional. … He’s the glue for our club,” manager Dave Roberts said. Save for Yasiel Puig snapping his bat over his leg after striking out swinging with the bases loaded in the seventh, Los Angeles stayed steady as Milwaukee tried to hold on. Pedro Baez got four outs for the win, and Kenley Jansen worked the ninth for the save. Jansen broke NL MVP-favorite Christian Yelich’s bat for a groundout with a runner on second for the final out. Former major league slugger Prince Fielder threw out a ceremonial first pitch. Fielder said Counsell helped him a lot when they played together in Milwaukee. “There was one time I was thinking about bunting and he told me if I bunt, he’ll punch me in the face,” a chuckling Fielder said. Chacin had his worst start of the season at Los Angeles on Aug. 2, allowing nine runs, eight earned, and five hits in 4 1/3 innings in a 21-5 loss. The veteran right-hander is 5-5 with a 4.96 ERA in 12 career starts at Dodger Stadium. Buehler is making his second career start against Milwaukee. The rookie right-hander tossed seven innings of five-hit ball in a 1-0 loss to the visiting Brewers on July 31.